Singing in the shower offers immense satisfaction to many people and cuts across age or racial lines. While singing and showering can soothe tired sinews and souls, environmentalists have always lamented the amount of water wasted in a shower. 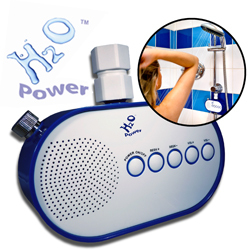 What better way to make full use of shower water than to get a Water Powered Shower Radio hooked up to the shower hose? The running water will turn a micro turbine in the device which will power a generator and produce energy. A stream of news, songs, and entertainment will accompany one in the shower at no cost to the environment. The music accompaniment may also help to improve one’s singing in the shower! 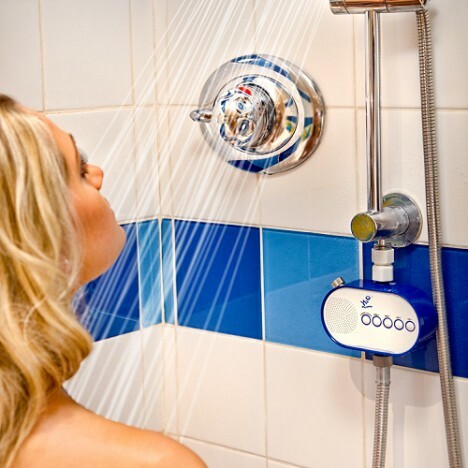 The Water Powered Shower Radio is easy to install and elegantly designed to fit in with other bathroom fittings. One possible limitation of this device though is that it may encourage one to stay longer in the shower than necessary, therefore using up more water and energy.